Leeds, UK, 3rd April 2015 – BigChange, the mobile workforce technology company, today announced the launch of Scheduling Assistant, a revolutionary new service enabling businesses of all size to maximise the capacity and efficiency of their mobile workforces. 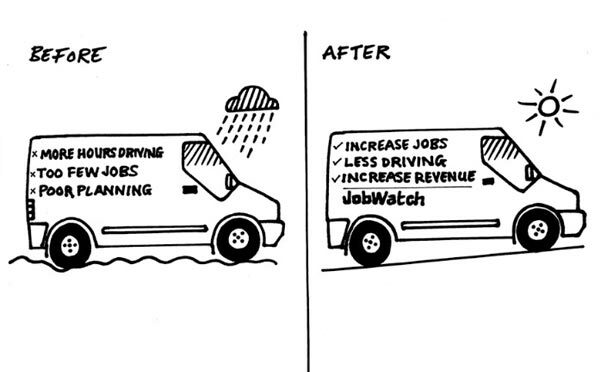 Available as part of BigChange’s online JobWatch system, Scheduling Assistant connects to mobile workers’ diaries and telematics systems, to help back office personnel pick the lowest cost mobile worker with available time within an agreed customer service level. Scheduling Assistant considers a wide range of factors – including the existing schedule, location, capability and rate of each mobile worker – to calculate the travel time, distance and total cost associated with assigning new jobs to them. These considerations include return journeys to base or their next job. Back office personnel are able to allocate and dispatch a job within seconds. The customer will get immediate notification of the appointment, which they can accept instantly and get real time progress updates. The job is added automatically to the schedule on the appropriate employee’s BigChange mobile computer. Customers already using the BigChange Scheduling Assistant have dramatically increased the amount of billable time available for each mobile worker. Early adopters have been able to extract more than £500 worth of additional billable time a month for each mobile worker and achieve significant reductions in travel time. It has also helped reduce fuel consumption, typically saving 300 miles per month for each mobile worker.